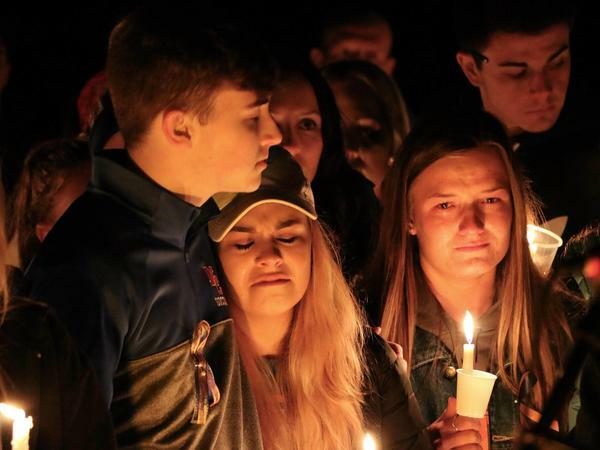 A vigil after the fatal shooting at Marshall County High School on Thursday, Jan. 25, 2018, in Benton, Ky.
A Kentucky teenager faces two counts of murder and 14 counts of first-degree assault in charges stemming from a January 23 shooting at Marshall County High School, in Benton, Ky.
Gabriel Ross Parker, a 15-year-old sophmore, will be tried as an adult. His identity had been widely circulated, but it had not been confirmed by authorities until Friday's arraignment. The Courier-Journal reports that bond was set as $1.5 million. Parker is accused of killing two 15-year-old students and injuring 21 others, including 14 who were shot in the early morning attack. He was apprehended immediately after the deadly shooting. Benton, Ky., a town of about 4,000 residents, is 248 miles southwest of Lexington.